Turning NO into YES for more than 40 years. 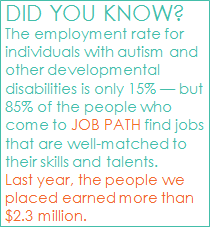 JOB PATH was established in 1978 to find ways to help young adults and adults with autism and other developmental disabilities join the workforce. JOB PATH was a pioneer: the first effort of this kind in New York State and one of the first in the country. Today our programs help people find jobs, live in their own homes, and contribute to community life.